We started our first day in Bologna slowly, with a frothy cappuccino and a sweet brioche, before venturing out into the damp, chilly air. 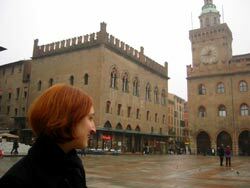 We kicked off our sightseeing at the Piazza Maggiore, which is the main square in Bologna and the heart of the medieval city. It’s a vast plaza flanked by the fortress-like Palazzo Communale (or town hall), the hulking Basilica de San Petronio, and several other palazzi serving various governmental and cultural functions. The Basilica is a very odd building indeed. 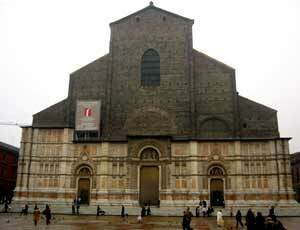 Construction on it started in 1390, and the plan was to make it larger than St. Peter’s in Rome. Needless to say, the Pope wasn’t too pleased with that idea, so the money that was being used for the cathedral was redirected to the university, among other things, leaving the basilica in an incomplete state even after centuries of building. So the basilica has a bit of a dual personality: its bottom section is covered with a red and white arched marble facade, while its top section (which I actually think is far more interesting) shows the bare, dark brick that was actually used to construct the building. It’s not exactly pretty, but it’s intriguing. The interior of the church is spacious and rather empty (and it was very, very dark on the day we were there), but there were three things in there that absolutely fascinated me. The first was a collection of large, early medieval crosses that apparently used to be dotted around the city. The second was an enormous meridian line along the floor which was used in the establishment of the Gregorian calendar. And the third was a tiny museum tucked in the back corner of the enormous cathedral. It consisted of just two rooms, one filled with architectural drawings and models of what the completed cathedral could have looked like, and one filled with reliquaries containing an extremely creepy collection of teeth and finger bones and the dried blood of saints. After leaving the cathedral and laughing at the kids chasing pigeons on the Piazza Maggiore for a while, we meandered over to the Quadrilatero, the winding streets to the east of the piazza which house the market stalls and food shops that have served the people of Bologna since the Middle Ages. It was a Saturday, so the streets were all a-flutter with Italians doing their weekend shopping. There was an overwhelming amount of food on offer. The stalls were piled high with seasonal porcini mushrooms and truffles, chestnuts and squashes, artichokes of all sizes, leafy green vegetables, and varieties of tomatoes I had never seen before. 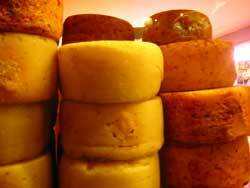 The shops were packed with cheeses and meats. The ubiquitous parmesan was there, along with grana padano, pecorino, mascarpone and about a million unfamiliar, rustic-looking others. The butcher shops had fresh rabbits hanging in their windows, the fish shops had piles of seafood fresh from the Adriatic, and the cured meat shops had huge haunches of prosciutto di Parma and great rolls of mortadella, together with a dizzying array of hard salamis, dried sausages and various other types of ham. Just seeing the abundance of food got our stomachs rumbling, so we made a break for Tamburini, a famous Bolognese delicatessen that does an extravagant self-service lunch in the afternoons. Through a combination of broken Italian and lots of gesturing, Jeremy and I managed to fill up our trays with pasta, salads and roasted vegetables. The salads contained the most flavorful arugula I’ve ever tasted, the roasted eggplant was meltingly soft, the mozzarella was milky and tangy, and the sprightly Valpolicella washed everything down perfectly. With full tummies once again, we left the hubbub of Tamburini and made our way over to one of Bologna’s landmarks: Le Due Torri, the two most famous medieval towers in the city. The smaller of the two, Garisenda, is tilted at a ridiculous angle. It was already leaning back in the 1300s, and its top half was eventually taken off because the tower was in danger of toppling completely. Besides its stunning tilt, Garisenda’s other claim to fame is that it’s mentioned in Dante’s Divina Commedia, and the relevant canto from the Inferno is inscribed in the base of the tower. 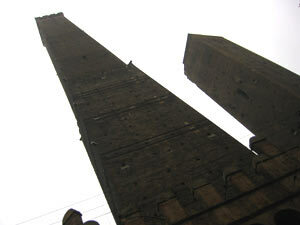 Its much, much taller counterpart, Asinelli, is a massive hulk of dark stone which looms 325 feet high - and which, amazingly, you can climb if you so desire. Jeremy and I had passed by the towers the night before on our evening perambulation, and after capturing my first glimpse of Asinelli reaching into the night sky, I said, “There is no way I’m climbing that.” Heights are not my favorite thing in the world, and just gazing up at the narrow pinnacle of the tower made me feel rather light-headed. The tower was no less terrifying by the light of day, but I knew the view from the top would be spectacular (on really clear days you can see the Adriatic and the Alps), so I steeled myself for the climb and we marched into the tower. The climb wasn’t actually as bad as I thought it would be. It was certainly less terrifying than climbing to the top of the cathedral in Freiburg, anyway. 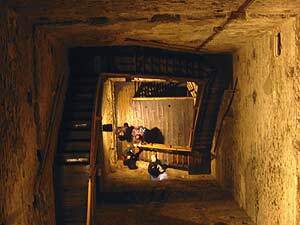 Climbing the Münster involved navigating an endless, stunningly narrow spiral staircase made up of stone steps with slick grooves worn into them from centuries of people trudging up and down. The steps to the top of Asinelli are narrow as well, but they’re made of fairly sturdy wood, and there are tiny landings at the top of each flight of stairs where climbers and descenders can just barely squeeze past each other. By holding tightly to the handrails and just watching where I was putting my feet, I made it to the top with much gasping and wheezing, but a minimum of terror. I was spurred on by the thought of the view that awaited me. Well, there was certainly no chance of seeing the Alps that day; Bologna was shrouded in fog, and standing at the top of Asinelli was like standing in a cloudbank. 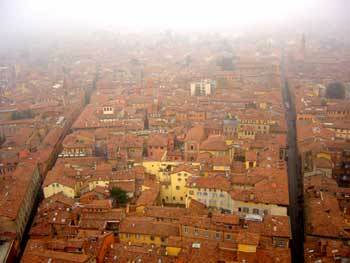 Still, the jumble of red roofs was spectacular, and because it was impossible to see beyond the bounds of the medieval part of the city, it really was like being lost in the mists of time. It was also fun - and terrifying - to be able to peek over the edge and look down onto the top of Garisenda, which seemed positively puny by comparison. After getting back down onto solid ground again, we forced our wobbly legs to take us in the direction of an espresso. 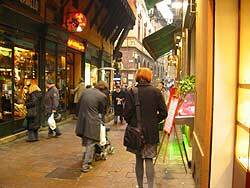 There’s certainly no shortage of cafes in Bologna, so we chose one that seemed nice and had a bit of a breather while we decided what to do next. We were both pretty wiped out, but I was adamant that I wanted to see Bologna’s medieval museum, so I mercilessly hauled Jeremy away from the comfy cafe and dragged him back across town in search of the Museo Civico Medievale. This was pretty much an ill-fated venture right from the start. To begin with, we couldn’t even find the museum (despite having passed at least twice the night before). 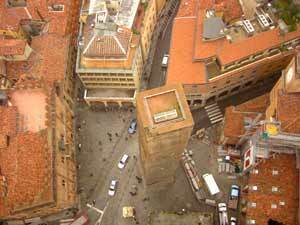 Bologna’s pleasing jumble of winding streets suddenly became very frustrating indeed, and we trudged endlessly up one alleyway and down another for what seemed like an eternity before we finally stumbled on the entrance to the palazzo that houses the museum. We managed to get our tickets and enter the museum, and things seemed to be going well after that - until we began to repeatedly run into museum staff who would try to tell us something in Italian while pointing in one direction or another. Jeremy and I had been feeling fairly smug about our linguistic success up to this point. Neither of us speak Italian, but with a combination of phrase books, a dictionary, and dogged persistence, we had managed to get by without speaking English to anyone. But the medieval museum was the site of our downfall. The peak of our embarrassment was reached during an interminable “conversation" with a woman from the museum who tried vainly to tell us something in Italian, in French, and I think in Spanish, too, while we just looked at her blankly and said, “I’m sorry, I don’t understand” in three different languages. She finally, pityingly, let us go, and we continued on our way down some stairs…which ended in a dead end, at which point we realized what she (and everyone else) had been trying to tell us all along: we were going through the museum in the wrong direction. Minor humiliation aside, the museum was interesting (though not quite on the level of the museum of medieval history in Paris), and it let us work up an appetite for our next meal: dinner. 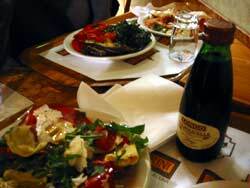 Finding a place to eat without a reservation on a Saturday night in Bologna is pretty much like trying to do the same thing in Brighton - namely, almost impossible. It was only with a great deal of luck (and a very nice head waiter who was willing to squeeze us into an already packed restaurant) that we finally got a seat in the Trattoria Anna Maria. It’s a convivial little restaurant with an artsy crowd (singers, actors) and the requisite autographed photos lining the walls. We ordered a carafe of the house red, which nicely complemented the delicious homemade pasta we had as a starter (tagliatelle for Jeremy, tortellini with gorgonzola for me) and the fantastic roast meats we had for the main course (rabbit for Jeremy, and crispy, succulent guinea fowl for me). 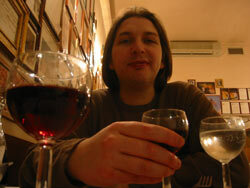 It was a delightful, cheerful place to sit and eat. Seeing as it was a Saturday night, we decided after dinner that it might be fun to find an osteria for another glass of wine and a taste of Bologna’s nightlife. We ended up in a packed bar back near the medieval museum, where we sipped not-terribly-good wine, nibbled on a plate of ham and salami, and watched well-to-do Bolognese party people dance on the tables to dreadfully loud 1980’s Euro-pop. It was an experience, but not necessarily one I would be in a rush to try again. I don’t think we even finished the wine, actually - we just paid and split, and went back to the sanctuary of our hotel for the evening.